Carboys, light clear blue, FDA approved polyvinyl. Resistant to repeated washing and shock. Neck ID 40 mm 53 mm OD diameter (Fits #10 stopper). 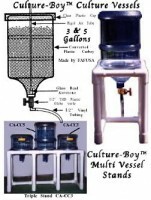 Jugs are 12″ in diameter, 5 gallon jugs are 21″ high and 3 gallon are 15″ high. Sold by the case only (6/case). Volume, light weight item subject UPS 30 lb. category . For those who heat-up or pasteurize culture water within standard carboy vessels please see our specially designed 1000 W titanium heater (SB-S140).